The two women on the left thought a small retreat for writers of Kid Lit would be a good idea. Laurie Smith Murphy in the foreground, and just behind her, Linda Crotta Brennan. We owe them BIG TIME for their genius. You see those people talking? The woman laughing? The lamp-lit snow in the window behind her? Dim light and intimacy in a rustic setting; words shared in the middle of nowhere. 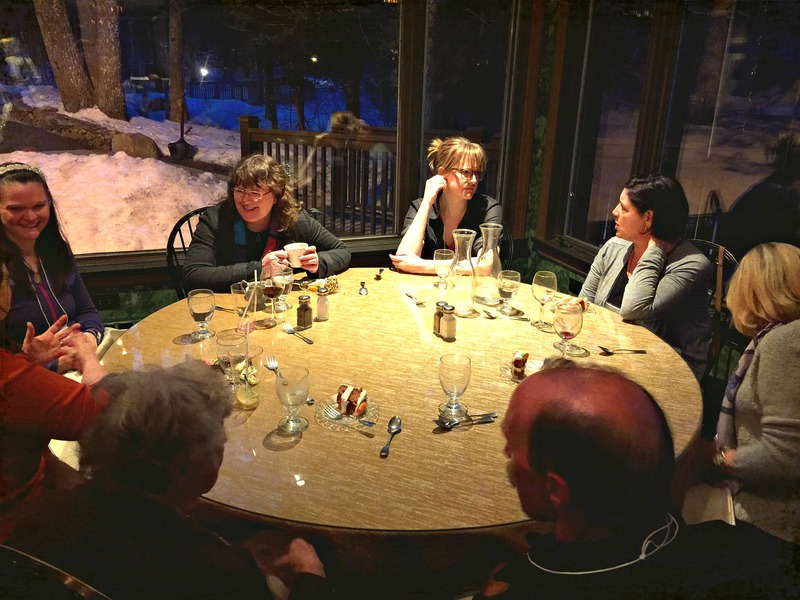 This was opening night at the SCBWI Whispering Pines Writer’s Retreat last weekend, and I was there. I have been lucky enough to have attended this event for thirteen years, the last four of which I had a hand in running with the amazing Lynda Mullaly Hunt. Five years ago I wrote here about the anticipation I felt beforehand. This year was even more special. It was both the 20th Anniversary of the retreat, and my last as acting Co-Director. 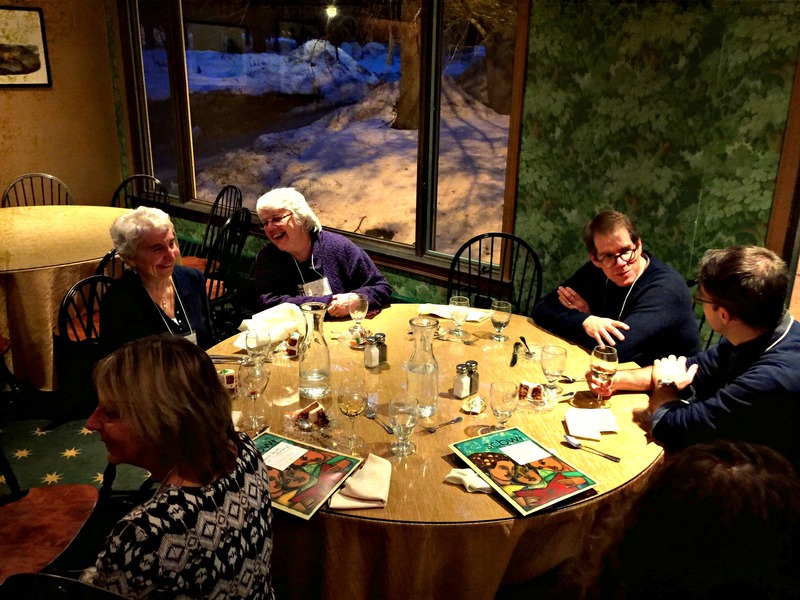 There were more attendees than ever before, more mentors (three editors: Sylvie Frank, Kendra Levin, and Mallory Kass; three agents: John Cusick, Erin Murphy, Ammi-Joan Paquette), more words. More fun. I wish though, I would have taken more photos. Talked to more people than I did. I wish it would not have gone by in such a blur — good things always happen that way. And, yet, when words abound and fill the space you occupy, when ideas flit like birds, some will linger long enough to feel true. I will wear a vest (more likely a sweater) of invisibility when I leave my room momentarily so that my husband knows not to talk to me. I’m not actually in the kitchen pouring tea or water in my cup, I’m still at my desk. I’m still writing. He will know that my head is filled with all the words that fit. It cannot handle more at that time. I will call my inner critic Velveeta. Because how can you listen to, or believe in a critic with a cheesy name like that? Without motivation, there is no story. Writing is good for the soul. To that last I would add that writing retreats in general are also good for the soul. It takes me days to process what I learned, which in turn improves my writing. And it gladdens my heart to think of the kind and lovely people I have newly met and added to the list of names that I call friend. It’s such a corny thing to say (Oh, shut up Velveeta I’m going to say it anyway), but I have drunk from the well of inspiration, and it was good. It will sustain me for a while. At this table more smiles and conversation. In the center, directly in front of the window, is my partner-in-crime, Lynda. She is the Energizer Bunny of organizing magic. This sounds wonderful. I am envious! It was indeed, wonderful, Mae. You would have loved the landscape of the place. Inside, warm rooms filled to overflowing with words and laughter. Outside, tall pines, a lake, and breathtaking stillness. Velveeta! That’s great. haven’t named mine yet. It actually came to me while I was writing this piece, and that voice was so annoying! Velveeta made me laugh. Fabulous! I love how you wear an invisibility cloak around your husband. Mine never knows when I’m in the zone. While eating breakfast, I read blogs and answer comments in the kitchen, so the poor guy never knows if I’m concentrating or not. I know, right? One of the agents at the retreat gave a presentation about balancing one’s writing and life. The invisibility vest thing was an anecdote from the author Bruce Coville. That’s what he does. Made perfect sense to me. My husband does not get that just because he “sees” me in the kitchen getting a drink, I’m not open to a conversation. What will your invisibility cloak be? Missed seeing you, Mary. Thanks for this lovely peek into the conference. Oh, Bette Anne, I really missed you! I have an email to you in my drafts folder. Hope to see you in Springfield. Sounds terrific! If you’re ever in LA, Mike and I have a cousin there who is active in SCBWI. Nice to know, Lois. I’d love to be in LA. The big SCBWI conference is always held there in August, but I’ve yet to go. One of these days . . .
“All the words that fit” completely capture the love/hate relationship I have when my brain is brimming with a story and I’m clamoring for paper and time to get it written down. You always inspire me, Mary. Thank you!!! Thanks, Michelle. It was divine. It was also tiring. But I came home inspired anew, and with fresh ideas, which was the point. One of the things John Cusick (agent) spoke to in his presentation, was making the time, even if it’s brief, to show up at a certain spot and write. Hey Velveeta, do your worst. Like that the wine glasses are all — or almost all — empty. Sounds like a wonder filled retreat. I know. Surely someone called Valveeta is not to be trusted, right?! It was a fabulous retreat, indeed. Thanks for stopping by, J.B. Always lovely to hear from you. Sounds fantastic! What a wonderful way to spend a weekend!